Our favourite cupcakes, which happen to be gluten-free, have a new icing! This amazing combination of chocolate and peanut butter reminds us of delicious Reese’s Peanut Butter Cups. Just when you thought these cupcakes couldn’t get any better. 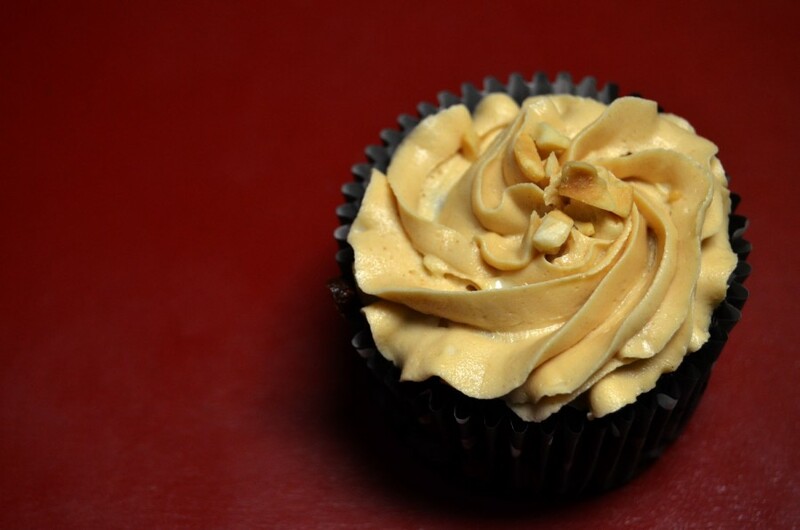 Find the original recipe with our Bailey’s Icing here. Bring the quinoa and water to a boil in a medium saucepan. Cover, reduce to a simmer and cook for 12-15 mins or until tender and all of the water is absorbed. Add the butter and semi-sweet chocolate. Stir consistently until both the butter and chocolate are melted and mixed in with the quinoa. Let cool almost to room temperature. Preheat the oven to 350F. Line muffin tins with cupcake liners. Add the sugar, cocoa, baking powder, vanilla and salt into the quinoa mixture. Mix well. Add the eggs one at a time, mixing after each addition, until fully incorporated. Divide the batter evenly among the muffin tins until each are about 2/3rds full. Bake for 15-20 mins on the middle rack until a toothpick in the centre of the cupcakes comes out clean. Let cool completely before icing. While cupcakes are cooling, prepare the icing. In a large bowl or stand mixer, whisk together the powdered sugar, milk, butter and peanut butter. Mix until smooth and creamy. To ice the cupcakes, place icing in a piping back with your favourite piping tip and ice the cupcakes as you desire. Or using a knife, spread the icing on each cupcake. Top with a sprinkle of chopped peanuts. I am a gluten lover, and I honestly could not tell there was no gluten in it, couldn’t taste the quinoa at all!